Gina O’Neill, an art teacher at Ballard High, is collaborating with Jesten and Lynn, the Teen Services librarians at the Ballard Branch, to showcase student artwork. 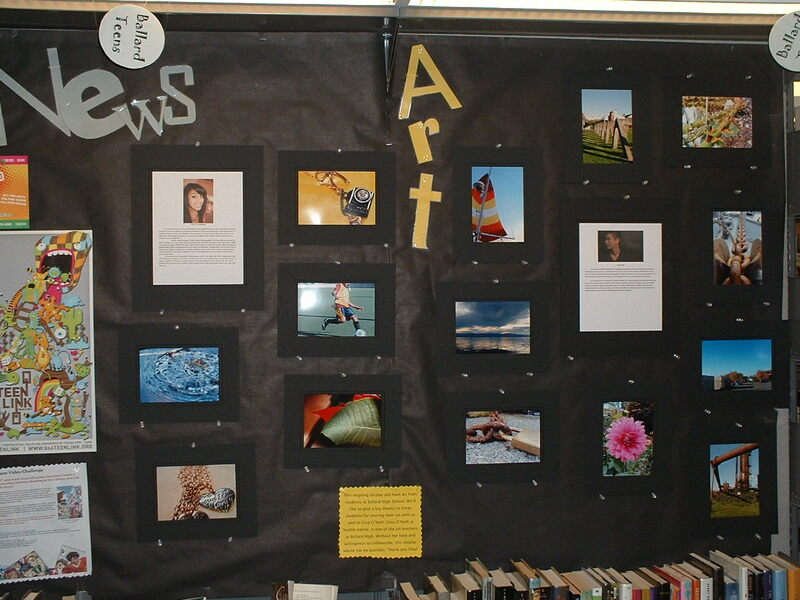 It is a great opportunity for library patrons to see artwork from local teens and for the artists to show their work. Evan Philip and Pooja Viswanathan, both Ballard High students, are being featured for the next three weeks at the Ballard Branch. Evan and Pooja both have a number of amazing photos! Most of the photos are of local places so you will recognize them. I enjoyed learning how Evan and Pooja got into photography. Come and take a look for yourself! You’ll be glad you did. This entry was posted in Art, Community, Libraries, News, Read This!, Seattle, Tidbits and tagged Art, Ballard HS, high school on January 29, 2011 by pushtotalkteens. I like art because it is ambiguous. It can be so many things and still be beautiful in the eye of the beholder…There is always room for improvement in art…The challenge brings out creativity in artists by forcing them to try new things they are less comfortable with. Her art work and that of 28 other Ballard High School students will be on display for the month of May throughout the Ballard Branch Library during regular open hours. You can also visit Ballard Branch during the Second Saturday Art Walk on May 9th, 6-9 pm. The Ballard Branch Library will be open after hours! Award-winning student video productions will be shown – Ballard Jazz combo will play – and some of the freshest art will be on display. This entry was posted in Art, Community, Events and tagged Art, Ballard HS, Community, local artists on May 5, 2009 by pushtotalkteens.